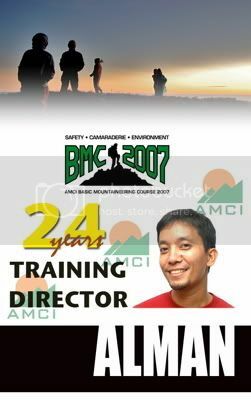 without desiring to be informed, i was made aware that this day marks the beginning of another year of AMCI's basic mountaineering course. i have been scarce lately, due perhaps to my aversion to controversy, and a longing to be away from sources of negative energy. besides, i have resolved to enjoy my enforced sabbatical to a degree that would shame -- or at least, disappoint -- my tormentors, such that i have continued to live my weekends like the warrior that i have always been. but i am getting ahead of myself, and past wrinkles aren't about to be ironed today, nor demons exorcised when they pose no threat. the point of this entry, really, is that i am given an opportunity to write about last year's BMC, of which i was so deeply involved, having been its director. it was a constant source of pains and joy for me; it was a little odd that the BMC which gave me so much stress was also what offered me a lot of relaxation. but if anyone would have noticed why my entries on this blog were few and far between last year, the reason was precisely the level of my entanglement in the goings of the course. the club deals with these matters with an intensity that might be rarely seen elsewhere, and i only hoped to equal that uncompromising quality with dedication and passion. and i tried to achieve this by offering my trainees something that i have nowhere else experienced: at least twice a week, along with reminders of the details of the training, i sent them words that inspired, encouraged, and uplifted. in a world full of cynicism, where ideals are pilloried with the stones of doubt, where it is easy to sink if one of many pits of despair, i gathered carefully selected thoughts in the hope that somehow, my unsolicited sermons helped them survive the ordeal of the training. as it developed, my messages read like an aspiring mountaineer's daily bread, and i felt that no one else was better placed to have accomplished it than i, with my optimism and my deftness for the written word. 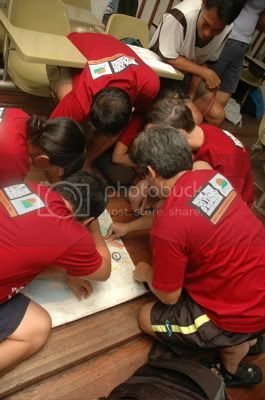 in this series, i gather the best of those many reminders with hitherto unseen photos of the training. i received many emails -- some from people whom i have not even met -- congratulating me and thanking me for my efforts. little do they know that i may have been writing instructions to myself. but i will confess that the business of motivating others is extremely exhausting. each time i had finished a message, regardless of its length, i always felt depleted, like i had just donated blood. perhaps that's true. everything that i had written was sincere, and came from the heart. so i guess with this exercise, i am performing a transfusion. after all, and despite all our optimism, we all need encouragement and validation even once in a while. A lot of people like to describe their successful ascents to the peaks of difficult mountains as conquests. It is not unlikely for you to hear some mountaineers proclaim that he or she has conquered this or that mountain. In fact, you might even come across the statement "mountain, you have been owned." Once you've hurdled obstacle after obstacle, challenge after challenge scattered on the way to the summit, you cannot help but feel victorious. But the sport of mountaineering has never been, and should never be, a battle between man or woman and this mass of land rising to the heavens. The mountain is not an enemy that we must fight and vanquish. It sits motionless in the distance, swathed by a crown of clouds, garbed by sheets of grass and layers of forests. A mountain does not prevent us from reaching its highest point by placing in our path a series of difficult, and at times dangerous, impediments. Rather, we are the ones drawn to these challenges, because we seek adventure. Edmund Hillary, who had every right to brag about his triumph over the world's highest peak, was instead humbled by his achievement, and said: "It is not the mountain we conquer, but ourselves." Macliing Dulag, a Kalinga tribal chieftain, who probably knew nothing about Hillary's statement, himself said that you can never own the land – how can you own something which will outlive you? As the first training climb approaches, some of us will just add another mountain to our list of been-there's. But many of us will just have climbed our first mountain. You are allowed to feel as triumphant as you want. The achievement of witnessing your first sunset at the summit is by no means a small feat. 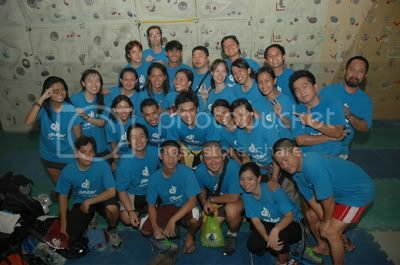 But remember also that you chose the sport of mountaineering because you wanted the challenge, the adventure. In the end, you will realize that it is always a personal victory. And that it is so much better to say that you've vanquished your fears, exceeded your limitations, and conquered yourself. There are many things not to like about your first training climb with a club which takes mountaineering as seriously as AMCI. One would be the warped sense of fun held by some members: they laugh at things which you already perceive as danger, are amused by foul weather, and seldom pause for breaks even when you feel your entire body shutting down. You are removed from the familiar comforts of your household, with no access to your loved ones, shivering in the cold, enduring a night without having taken a bath, sleeping on a wet, uneven surface, hiding in the bushes to answer a call of nature, settling for rice that's both burned but uncooked. There will also be many things that you might not be used to: being forced to sleep at lights out while the rest of the campsite explodes in rambunctious merry-making, preventing you from getting any decent sleep, and yet you get up very early the following morning to find your camp kitchen in utter disarray. And every 10 minutes, your GL reminds you that you have less and less time left to get packed and ready to start the descent. There is hardly any time for a moment's rest, and you begin telling yourself: this isn't what I signed-up for. The BMC is not for everyone. The rigors of mountaineering require a very specific attitude, and a mental state that's bordering on insanity. You might find yourself on the verge of crying, or at the point of quitting, because you've just realized that this isn't your idea of adventure, or that you're hardly pleased by the situations that are making your experience miserable. You haven't yet realized how the training is going to affect other aspects of your life. In time, you will learn to appreciate the little luxuries that are always within our reach when we're in the city. You begin to value the people who serve you and help make your life more productive and less stressful. You complain less. You develop the virtue of patience. You become more tolerable of other people. You are turned into a fantastic storyteller. You gain a sense of humor. You realize that is better to laugh at the injury, the mistakes, the wretched circumstances of your experience. And in the end, you're healthier and happier. You're actually becoming a better person. You signed up for mountaineering, and you're getting so much more in return. So the BMC isn't for everyone. But then again, you're not like everyone else. You may be bruised and feeling pain now, but you are still a winner, not because you've never failed, but because you're not quitting. To paraphrase traditional wisdom, no one really trips over a mountain. Rather, we trip over smaller things, such as rocks on the trail, exposed roots, slippery sections. If we get over all these small things, we will later realize that we have crossed the mountain. Over the weekend, many of us encountered a series of epiphanies that brought us near the edge. We may have finally decided, as we were descending the steep sections of the detour, that "this is not for me", only later to celebrate our achievement at the wash-up area with wide grins and happy anecdotes of our experience on the mountain. Many of us would have rather imagined ourselves relaxing on the sofa, watching our favourite show, than willingly subjecting our bodies to all that brutal punishment. But to think of the climb as punishment for punishment's sake will be to ignore the genius behind the design of your BMC. A climb of this degree of technicality is necessary to improve our skills as mountaineers, to inspire and encourage us in future climbs: when we begin to find a climb too difficult that we are about to give up, we can always look back on our ordeals during this second training climb and tell ourselves, "I've been through worse and survived." In the process of falling, tripping, having mud on our faces, trying to pull out something from out of our minds to get through the last hour of walking, we may end up cursing and hating many people. But in the end, it dawns on us: we've crossed the mountain, we've finished the climb. And pretty soon, you'll be looking forward to more of these self-flagellations. i was thinking actually, of how i should present my messages here, whether they should be in the order that i posted them or, as i have done, according to a theme. i noticed that my reminders had prevailing themes, like concern for the environment, values and character, exceeding limitations, etc. do you think it would have been more "natural" to present them in the order they were posted? Oh, so these are exact repros. I thought you aggregated several memos but neglected to insert transition grafs. It jumps from the first climb to certain incidents in the second climb -- the detour, its technical nature, etc. Ethos anthropoi daimon. The character of man is his guardian spirit. Nice. yup. all these are just re-posts of those messages. since i came out with about 30 of those, there should be around 10 more installments of this series. i've realized that all of them are beautiful, haha! thanks cecil, though i do not consider myself much of a philosopher. I am a freelance hiker just started this march and had climb more than 10 mountains with 1 major climb (Pulag Akiki trail last June'08). I'd like to inquire if your group offer BMC training this year? If there is, can i join? I feel there's a need to know the basics in actual training from a more experience people in this field, though i have read through the manual from the internet. hi val. thank you for your interest in AMCI's BMC program. and thanks as well for visiting my blog. 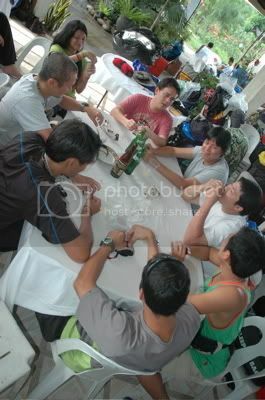 unfortunately, AMCI's BMC has already started, and in fact, they're having their first training climb this weekend. AMCI is rather strict on attendance, so i'm not sure if you can still join at this point (you missed it just be one week!). you can also try other clubs (as there are quite a few out there) who are only about to start their BMC programs. or you can just join us for some of our many open climbs. just keep watching my blog. anyway, i'll keep you in the radar.